I shoot a lot of images on my iPhone. It’s the camera that’s always with me when I stumble upon something interesting. In 2015 Apple introduced Live Photos at the iPhone 6s release, which creates a video showing the moments right before and right after you take a picture. These “sidecar” video files are 2 seconds in length and are embedded into the photo on your phone. While it was a cool idea, and I was excited for them when they were first released, but they’re become a bother every time I import photos from my iPhone into my Lightroom library. That being said, there’s an easy way to get rid of them quickly, as well as a way to disable them on your phone completely. A look at the image and video sidecar files in Finder. 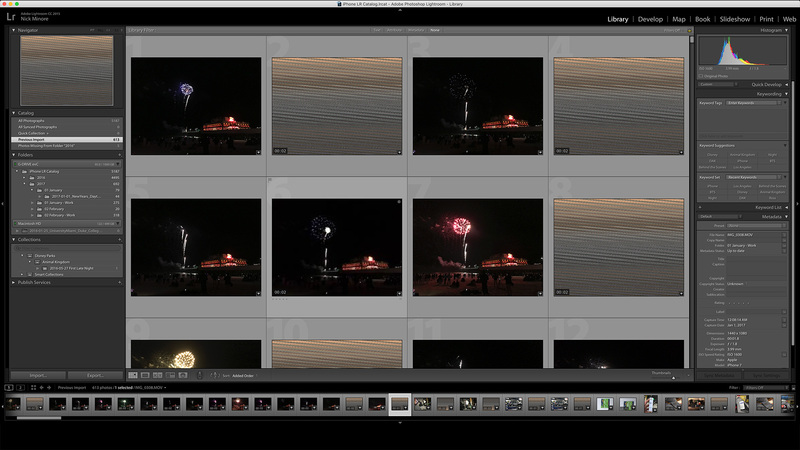 I’m assuming you already have the pictures and video files imported into Lightroom. From the sorting bar on the top-center of the screen, click on Attribute. This is going to allow us to sort by video files. On the right side of the Attribute bar, go ahead and click the last icon to sort by Video files. Now you’ll only see the video files in that folder. Notice all of the 1 and 2-second video clips. That’s what we’re looking to delete. Select the files you’d like to delete. You can click and then shift-click to select multiple rows or Control (Ctrl) or Command (Cmd) click to select individual video files. With your video files selected, right-click and choose Remove Photos. In the popup, go ahead and click Delete from Disk. Like most Apple features, it’s a little confusing how to disable Live Photos. There isn’t a dedicated off switch, but rather a series of modes that keep Live Photos shut off most of the time. Let’s first take a look at the camera screen. Notice the circle on the right-side of the screen? That’s the icon for a Live Photo. By default, it’s gray (meaning not selected) and you can click it, turning the icon yellow (to enable it). It looks like it’s always off, right? Buried deep in the settings, we find out that it’s automatically reset to On every time you open the camera app. On your iPhone, open up Settings. Scroll down to Photos & Camera, then scroll down again until you reach the Camera section and, then click on Preserve Settings. By default, Live Photos is checked to automatically reset to Live Photo turned on. If we shut off the switch, the Camera app will default to whatever the Live Photo button is set to. Remember how it looked gray when we opened the camera app? That means Live Photo is off. If the icon is yellow, Live Photo is turned on. There’s no way to permanently disable it, so this is the best we can do. With the Live Photo switched off in Preserve Settings, the default setting should remain off when we open the camera app. The only way it would get switched on is if we accidentally hit the Live Photo circle icon when taking a picture.